Water safety is a major concern in North Texas, where city officials and residents fret over the stability of the supply in the face of historic drought and widespread natural gas drilling. UT Arlington is taking the lead in this important field. On sprawling ranches and along country roads in Texas, a new inhabitant is taking over the landscape: gas wells. These mammoth structures jut from the ground of rural and urban areas alike, pumping millions of dollars—and plenty of controversy—into local communities. To extract natural gas, engineers use a process known as hydraulic fracturing, or fracking. It works by blasting a combination of fluid, chemicals, and sand into the earth to break apart rock and release the shale gas. But fracking is not without its critics, many of whom fear that the process harms the environment, despite assurances from industry officials of its safety and effectiveness. UT Arlington scientists set out to investigate the issue by studying the effects of fracking on water quality in the Barnett Shale, which spans 5,000 miles underneath 17 Texas counties. They found justification for the concerns, as elevated levels of arsenic and other metals were present in wells closer to natural gas extraction sites. Safety is central to numerous research projects on urban water at UT Arlington, which has emerged as a leader in the growing field. In addition to the widely publicized fracking investigation, ongoing research at the University deals with important issues like predicting flash floods and designing a new groundwater pipeline. This work is crucial. In Texas, a historic drought threatens the future of the water supply. Globally, water use grows at more than twice the rate of population. Maintaining the safety of the world’s water is vital to keeping people and communities everywhere alive and flourishing. 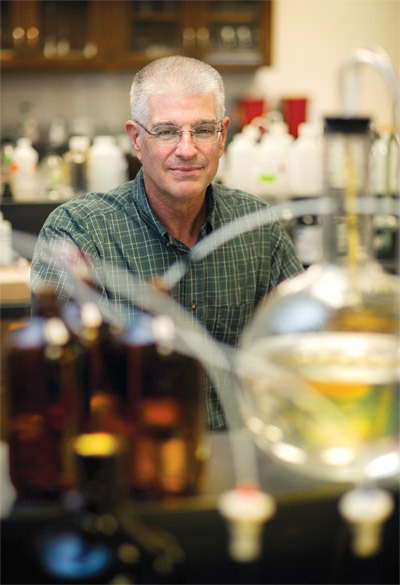 In summer 2011 Dr. Schug, the Shimadzu Distinguished Professor of Analytical Chemistry, and his research team posed a simple question: Has drilling in the Barnett Shale contaminated groundwater? The team’s analysis—detailed in the journal Environmental Science & Technology in summer 2013—did not pinpoint a cause for the elevated levels. Schug believes they could include faulty gas well casings, excess water pumping, or mechanical vibrations shaking rust into older wells. 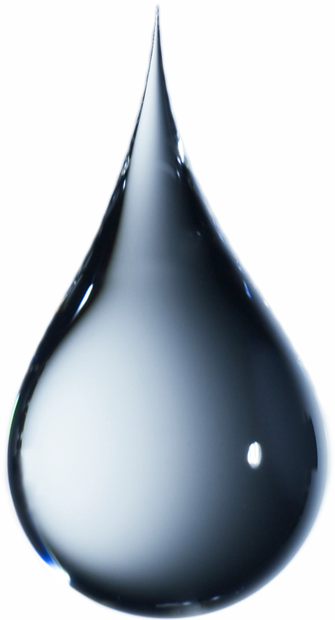 Rob Jackson, a professor of environmental sciences at Duke University who has extensively studied shale drilling, says this is the first study of water quality and fracking in the Barnett Shale, and its results make a powerful case for further research. This research could be used to develop best practices for fracking. If drilling can be made safer, it should be. Schug and his team, which includes Qinhong “Max” Hu, UTA associate professor of earth and environmental sciences, already are working on their next project, an analysis of the Permian Basin region of Texas. One of the hurdles of their Barnett Shale study was a lack of baseline data on the groundwater from before the drilling began. With the Permian Basin investigation, they had the opportunity to collect samples ahead of time. They plan to gather more during and after drilling, thus providing a fuller picture of fracking and groundwater contamination. As with the Barnett Shale study, the researchers are accepting no outside funding for the project to ensure the integrity of their findings. While Schug and his colleagues try to keep groundwater clean, another group of UT Arlington researchers is helping make it available to more people. The Tarrant Regional Water District is working with the University on its 150-mile, $2.3 billion Integrated Pipeline project. North Texas leaders have called the water highway crucial to the region’s future and continued growth. When completed, it could stretch from Lake Benbrook to Lake Palestine, delivering water to 1.5 million residents. Their goal is for the pipeline to be operational by 2021. But first, it must be designed and built. Aiding in that task are two UT Arlington civil engineers. Associate Professor Andrew Kruzic is studying the best methods and locations to add monochloramine to the water to eliminate biological growths in the new pump stations and pipelines. Adding the chemical—a combination of chloride and ammonia—helps protect water supplies from disease-causing micro-organisms and invasive species, such as zebra mussels, that have infested some North Texas lakes. 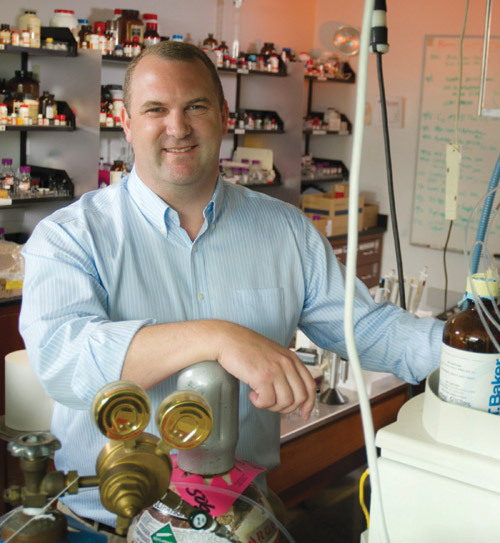 As part of a $400,000 grant, Dr. Kruzic also will study how to inhibit internal corrosion. Meanwhile, civil engineering Professor Ali Abolmaali is creating 3-D models of pipe and surrounding soil to simulate how they behave and interact over time. These models will be the first of their kind in the nation and could be used to design future pipelines. Dr. Abolmaali’s team also will conduct field tests and compare the results to the computer simulations. He believes that, taken together, the UT Arlington projects will help ensure the pipe’s targeted life of 100 years. Dealing with too much water is the concern of civil engineering Associate Professor DJ Seo, who is attempting to bring an element of predictability to flash floods. Helping him in that quest is a new weather radar sensor located on top of UT Arlington’s Carlisle Hall. Operated by CASA—Collaborative Adaptive Sensing of the Atmosphere—it is one of eight being placed around North Texas to monitor weather patterns as part of the DFW Urban Demonstration Project. Funded by the National Science Foundation, the $40 million, 10-year project is made up of a consortium of nine universities, industry partners, and government agencies, including the North Central Texas Council of Governments. 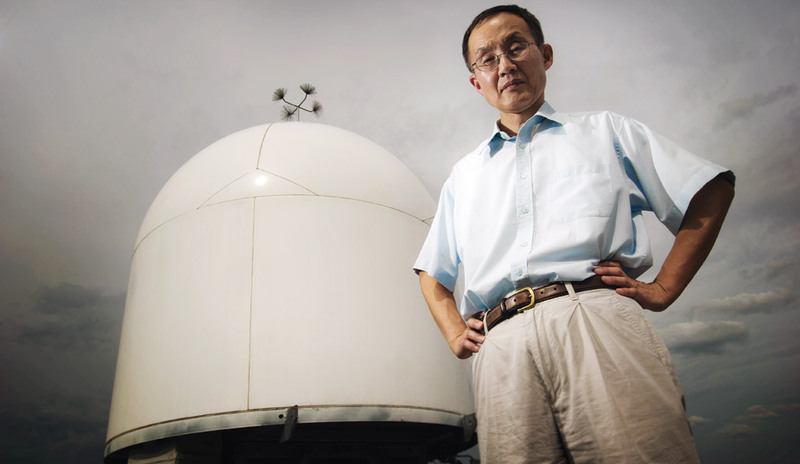 The Carlisle Hall radar provides lightning-fast, targeted data about rainfall and severe weather, which Dr. Seo is using to develop a system to monitor and predict flash floods. The hope is that it will allow officials to more effectively dispatch emergency personnel to save lives and property during a flash flood. DJ Seo in front of the Carlisle Hall radar. Current systems that monitor flooding are outdated, providing weather scans every five to six minutes. The new system will offer extremely high-resolution information about heavy rainfall or flash flooding every minute. To develop it, Seo and his team are integrating hydrologic and hydraulic models with data from the CASA system and geographic information system maps. Amy Cannon, an engineer with the Fort Worth Transportation and Public Works Department, believes the project will transform the city’s ability to respond to floods. Once complete, the forecast system could be used in other urban areas, providing a major boost to emergency management preparedness. Responders could gain a lead-time of up to 30 minutes in many flash-flooding situations. The prototype could even be adapted to support urban water conservation programs, a critical issue for parts of drought-stricken Texas. His contributions to this vital issue—like those of Schug, Kruzic, and Abolmaali—provide a clear example of how UT Arlington is committed to enhancing the quality of life in North Texas and beyond.